Big thanks to Chris with North Texas Turf Pros for sharing this info with us in the YouTube comments! 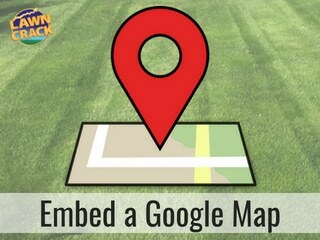 Check out the video tutorial on how to create and embed a custom Google Map on your website to show visitors your service area. This also helps with your local SEO! Below a link to the video with step by step instructions with some BONUS customizations you can do to really make your map stand out and provide the most value to those viewing it on your site. 6) Now you can do what you would like here to get real specific with your map! Use the search bar and enter cities, addresses, zip codes, counties, streets, neighborhoods, or whatever you want to populate on your map. Select the correct option for what you are searching for from the drop-down list of options Google offers you. You can add as many as you would like…Select ‘Add to Map’ for each search you do when you see the box pop up for that search on the map. BONUS – NOT IN THE VIDEO! Once you add your selection to the map you will have more options to customize each selection. You can simply change the color of the ‘pin’ by using the paint bucket icon option. From the paint bucket icon option, you can also change the ‘pin’ icon that shows on the map to one of many options, or upload a custom icon! You can change the name of the selection by clicking the pencil edit icon. You can also add a description for this location while in here. You can use the camera icon option to upload a photo or a video. How cool is that? That last option you have is to provide directions by clicking the arrow icon. I don’t think the direction feature is helpful for lawn care and landscaping companies…but it is another option you have. 7) Then, I like to use the ‘Draw a Line’ option…which is right under the search bar represented by 3 dots with lines connecting them. Outline your service area. Title it something like ‘Your Company’s Service Area’ and give it a description. Make sure to use keywords that reference your service area and what your company does! You can also change the color if you don’t like the standard grey. You also have some customization options for the area you just created. 8) Title your map by clicking on ‘Untitled map’ in the box in the upper left corner in the box where all your selections have been populating below. 9) Then click ‘Share’ and select ‘Change…’ Change the ‘Link sharing’ to ‘On – Public on the web.’ Click done was you complete step 9. 10) Then select the 3 verticle dots to the right of your new map title and choose ‘Embed on my Site.’ Copy the iframe code snippet to your website. If using Divi within WordPress, you would simply add a code module and paste in the code snippet. You can edit the width and height of your code snippet to get it to display properly on your site if you would like. The map comes standard as 640px wide and 480px tall. Simply change these values to the pixel size you would like your map to be. BAM! Now you are on the map! We are happy to put your business on the map for you! We charge $37 to create and install your map on your WordPress site. Please shoot Ryan an email and we will get it done. 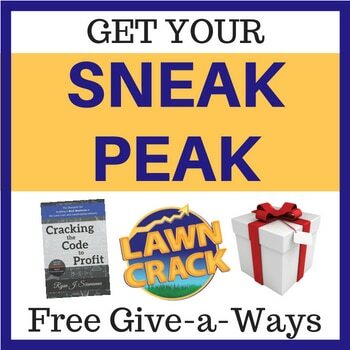 Lawn Crack is here to help your business grow. We are tired of seeing guys struggle to make ends meet as they pour their heart and soul into their lawn care and landscaping business. We will continue to put out free content on YouTube and in the resource section on LawnCrack.com. If you need more specific advice for your unique situation, please contact us. We also offer products that improved our business at the best prices around. Check out our Merch and More to see what we currently have to offer! What do you think? Please let me know if you put your business on the map and if the video and/or write up helped!